When you think of the word ‘Hell’ in a restaurant name, usually it will conjure up imagery if fire, darkness, extremity and so forth. However, Hell of the North did not fit these imagery. Instead, it was more heaven, heaven for our bellies. Hell of the North, as it turned out, was named after Paris-Roubaix bike race held once a year on Easter Sunday in Northern France which is famous for the rough terrain and hardship for the bike riders. It is a classic and very big event on the French calendar. 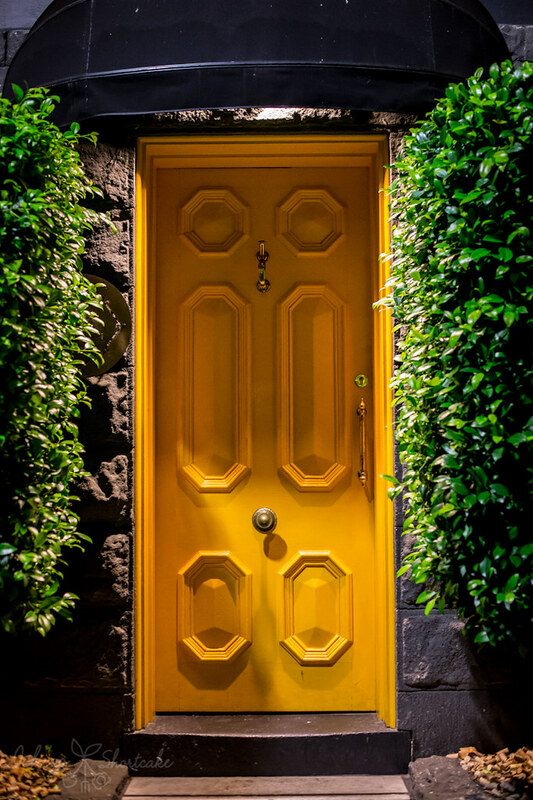 Our night started from the infamous bright yellow door (with no visible signage) and garden beds full of wine corks, as we entered a maze of rooms full of happy diners and cheerful chatter. 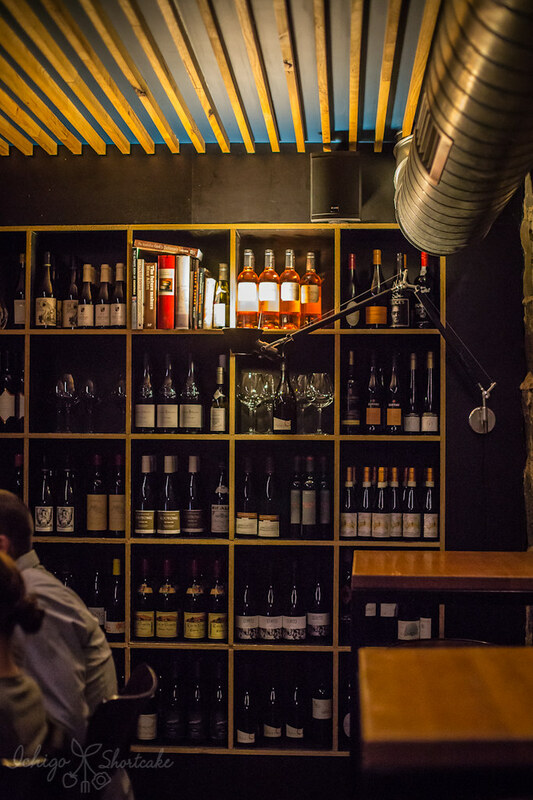 The bistro style French restaurant was decked out in wine and spirit bottles signalling what they are good at here. 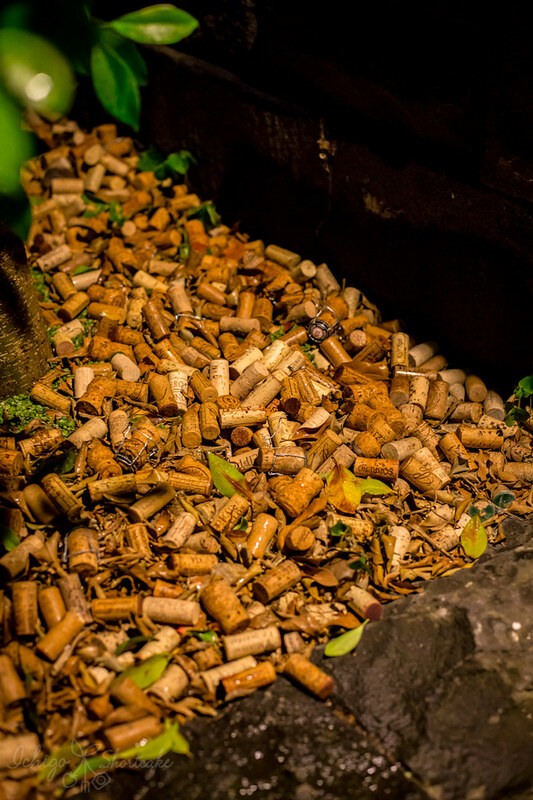 You should try something from the extensive wine list which we did. I ordered a glass of the 2012 Ansgar Clusserath Riesling Trocken from Mosel in Germany ($15) and it was one of the best rieslings I’ve tasted. It had a sweet start and a dry finish and was crisp and full of flavour but still matched well with our food. Yuye’s 2013 Mas Des Bressades Costieres De Nimes Grenache/Syrah from the Rhone Valley in France ($12) was also a good pick. It was a light style red with bold fruit flavours but did not have a big lingering finish. It paired well with the food as it didn’t overpower the food and still allowed enough flavour of the wine to shine through. we decided to order the $65 per person feed me option which included six dishes (one from each section of the menu) and two sides to share between two people. It was essentially a chef’s choice of dishes from the a la carte menu at a slightly cheaper price. Saying it’s chef’s choice, you can tell the waiter/waitress what you like and do not like to eat and they will try to accommodate. Yuye and I are generally more into eating meat so that’s what we told them. I think we made that mistake because the dishes that came were very heavy and carby that we were seriously rolling out the door holding our stomachs as we finished the meal! It really was a ‘feed me’ menu and we were more than well fed. 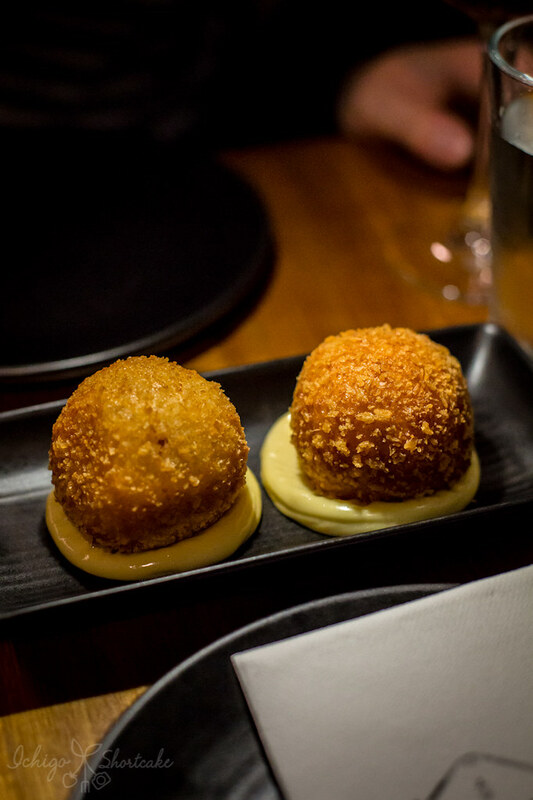 To start, we were given two pulled pork & gruyere doughnuts ($7 each a la carte) from the hors d’oeuvre. They were so amazing we were analysing it for a long time, trying to memorize the ingredients and possibly re-producing it at home (I highly doubt we can though). They were almost like the Chinese red bean filled glutinous rice balls at yumcha, except savoury, warm and so much better. 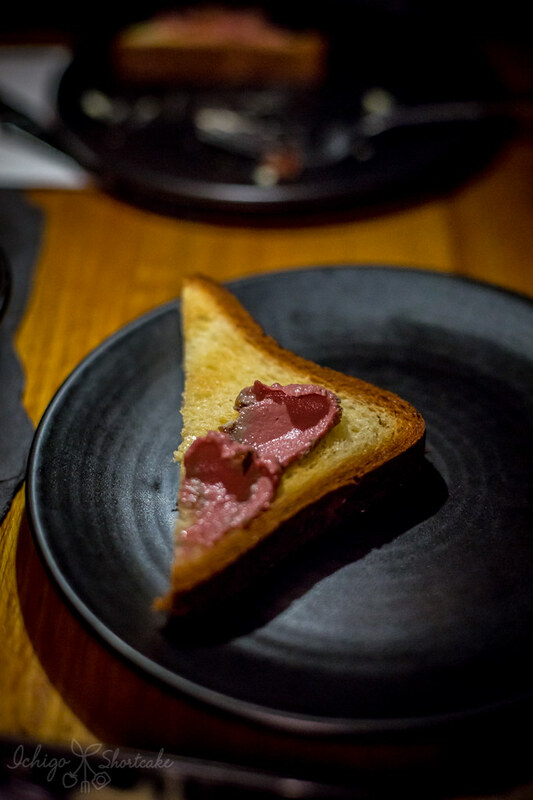 Next up was the chicken liver parfait, Madeira jelly and brioche ($16 a la carte) from the charcuterie section. The parfait with the jelly on top was glistening and so smooth that I almost didn’t want to break it apart. It was not as salty as some liver parfaits I’ve had and had a subtle sweetness from the Madeira jelly and the sultanas. There were many pieces of bread here and also a lot of parfait but because it was so tasty, we ate every bit of bread and even wiped the bowl clean. Perhaps we were hungry….or we’re just gluttons. From the small plates section we were given the beef tartare ($21 a la carte). 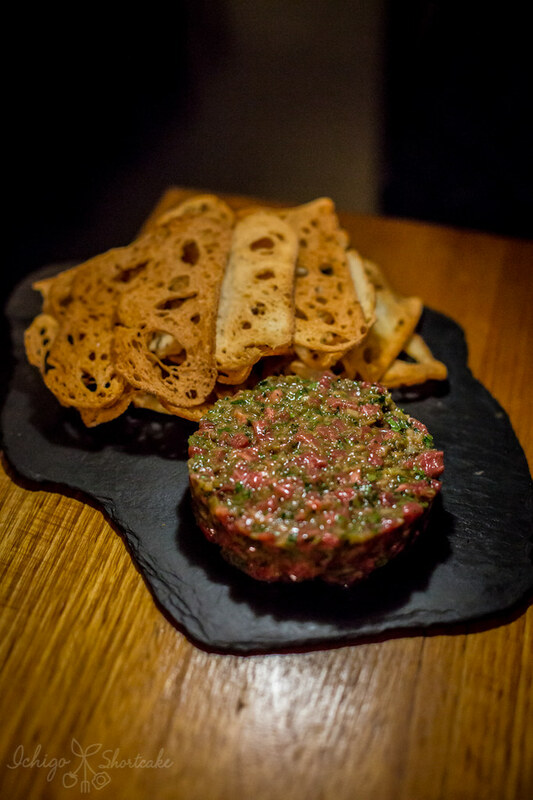 It was a well execute dish, the steak tartare wasn’t overly sour from the pickles but had a very nice flavour and the meat was so fresh. We didn’t finish all of the bread as we were actually starting to get full. 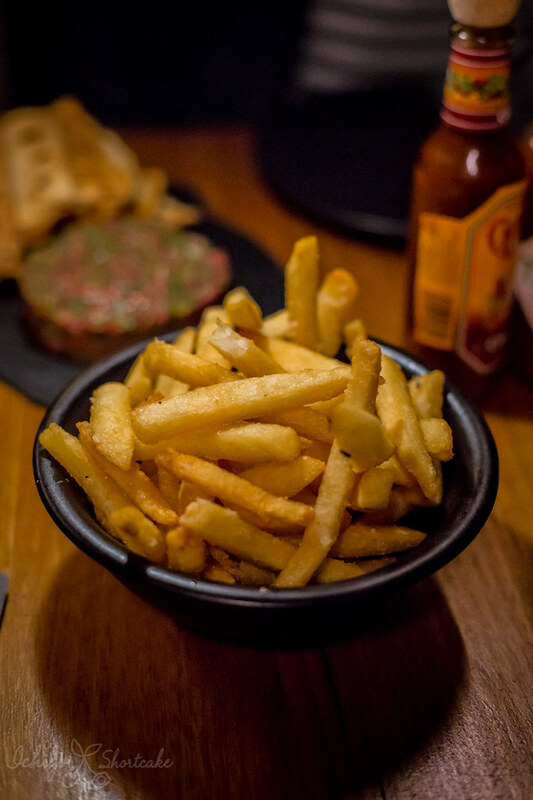 The steak tartare was paired with the pomme frites ($8 a la carte) which is French fries or hand cut chips in this case. If it wasn’t for the Feed Me option, I probably wouldn’t have ordered this side dish because there are more interesting sounding dishes on the menu. 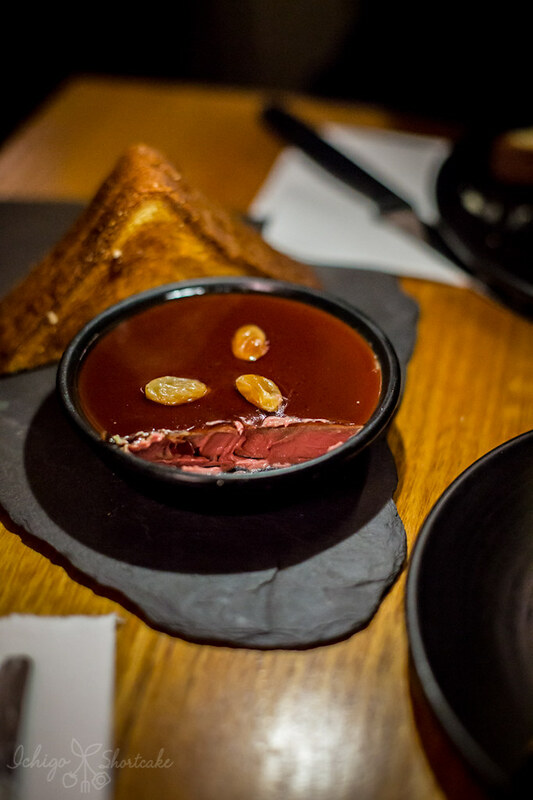 If we didn’t order this dish, we would have missed out big time! These are such unique and tasty chips because they fried it in butter. Yuye didn’t believe me at the start but the smell was distinctly buttery and made us think they may have used clarified butter so it didn’t burn. It had a strong rosemary taste and was quite salty but surprisingly not very oily. There was even little bits of cheese on top to give that extra touch. I told myself to stop eating them as I was getting full but my hands wouldn’t listen to me and I kept reaching for them one after the other. I never would have thought I can write so much about fries! 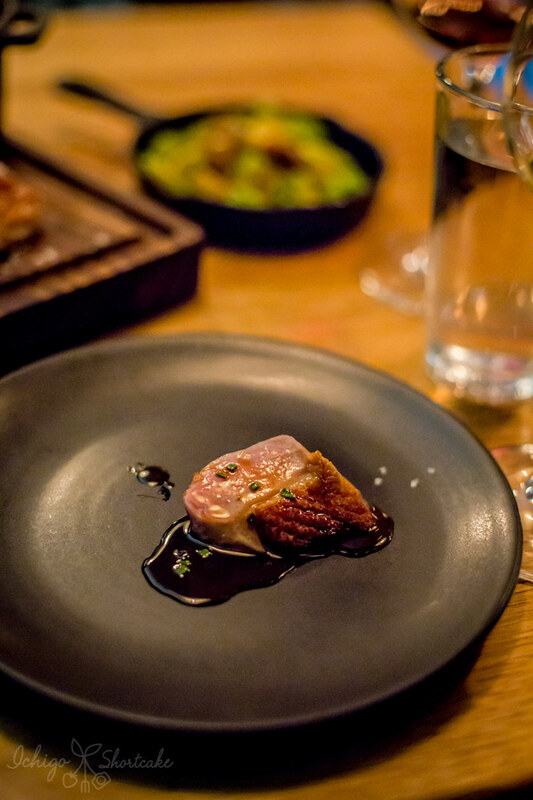 Now we move onto the main dish – Milawa duck, red cabbage and Madeira jus ($34 a la carte) which was also the highlight of our night. 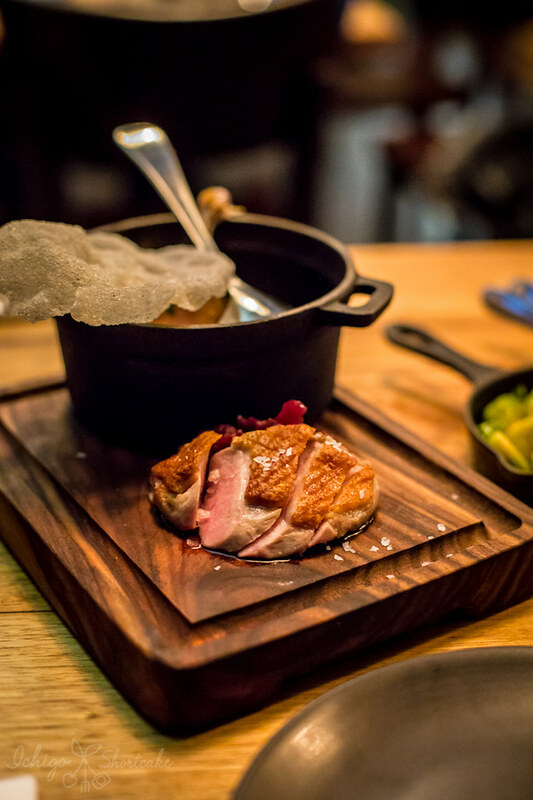 The dish came with two separate portions, one was the duck breast pieces served on top of the braised red cabbage and the other (served in a little pot full of the Dadeira jus) was the confit duck leg with a piece of crispy cracker. I could not stop squealing in delight as I bit into my duck breast because they were the most tender and perfectly cooked little morsels of duck I have ever had. They were even better than the duck we’ve eaten at higher priced fine dining restaurants. Seriously, no joke. It paired very well with the slightly sweet red cabbage. 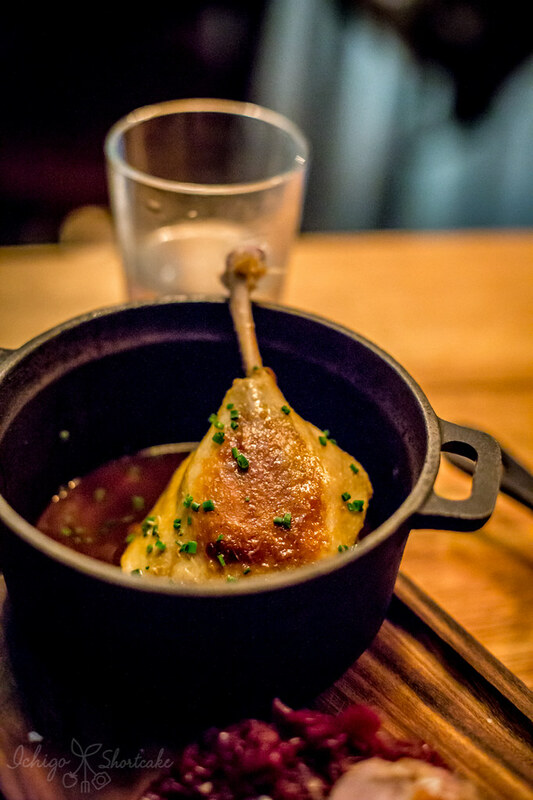 The duck leg was also very well cooked, better than most confit duck legs I’ve had, but compared to the breast, this was way outshone. The jus was just amazing. It was so umami and full of flavour that I almost wanted to lick the bowl (I’ve heard this one before…) if it wasn’t too salty to have on its own. The crispy cracker tasted like duck fat in crisped up form and was very tasty when dipped in some of that jus. 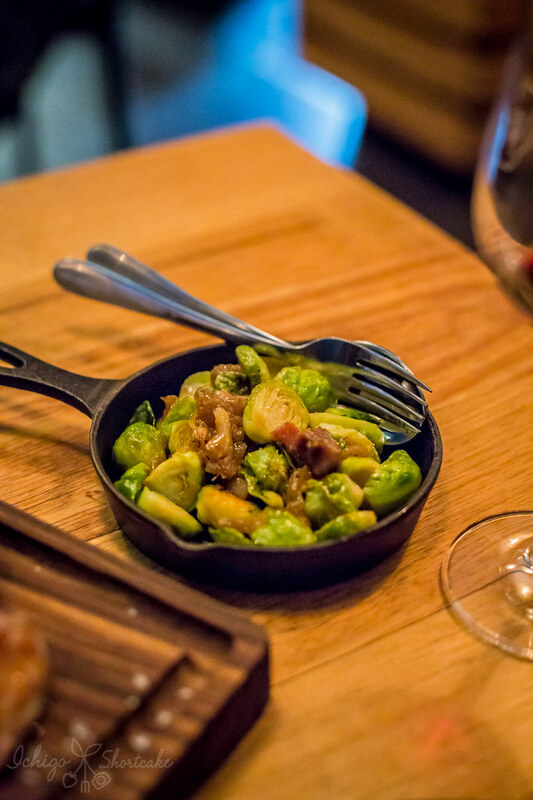 I even dipped our second side dish – brussels sprouts Lyonnaise ($8 a la carte) into the jus. The brussle sprouts were a little hard for my liking (I like mine well cooked through) but was made better by the little pieces of tasty and chewy pancetta. By this stage, I was seriously overeating. I had stuffed myself too full with the chips and bread at the start. 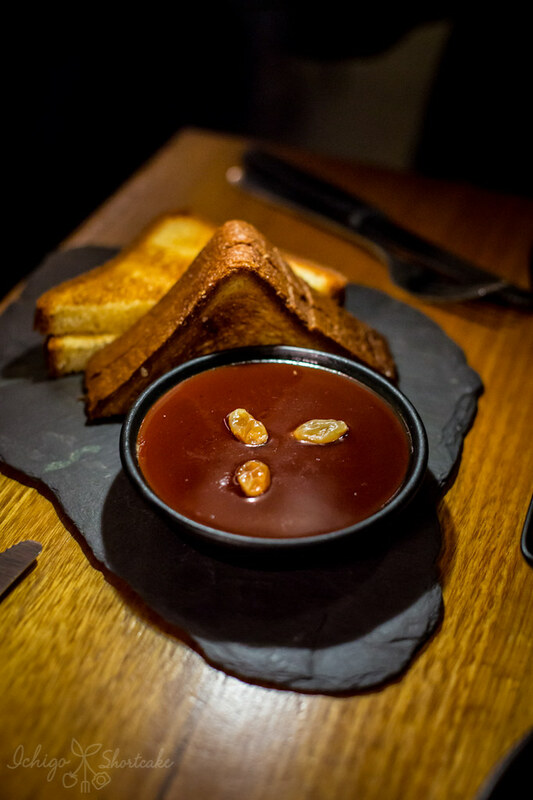 Thankfully the cheese dish wasn’t all that big – Aged Comté with amontillado jelly ($16 a la carte). 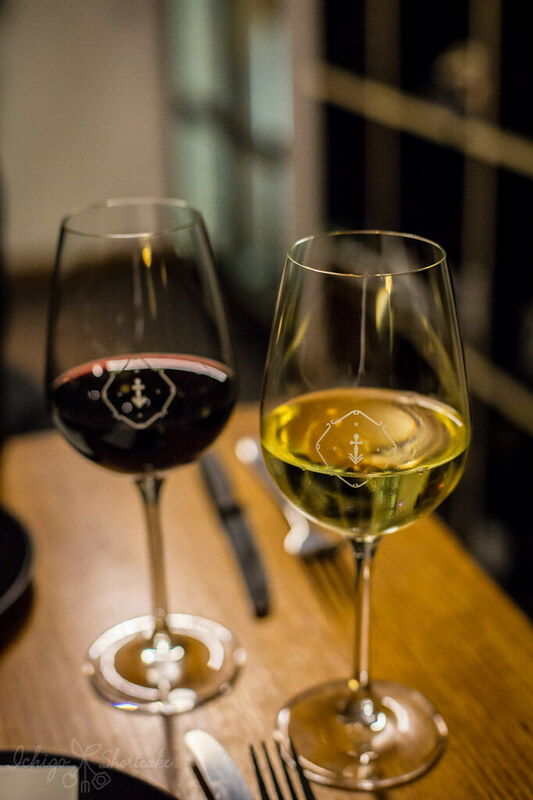 Amantillado is a type of Sherry wine while the Comté is a type of French cheese made from unpasteurised cow’s milk in the Franche-Comté region of Eastern France. 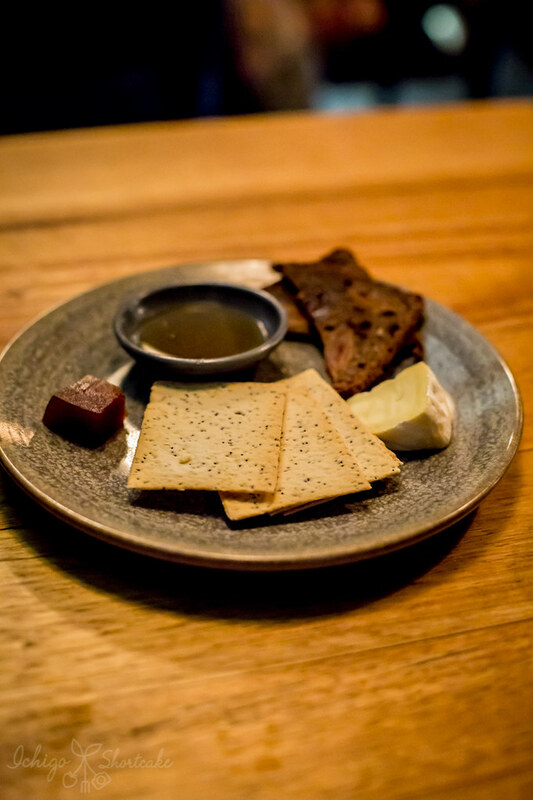 The dish also came with crackers, gorgeous honey and a piece of fruit loaf which wasn’t too sweet. We again couldn’t finish all of the crackers. If I had to choose, I wouldn’t have ordered the cheese platter just because I prefer a regular dessert dish. By this stage, we had finished our wines and wanted something else to drink so decided on the non-alcoholic Hell’s lemonade with cucumber and elderflower ($8). It came with a slightly too sweet but very elderflowery drink (which I assume they had put the elderflower syrup in twice). We added water to it as we drank and ended up getting a lot of value out of it. 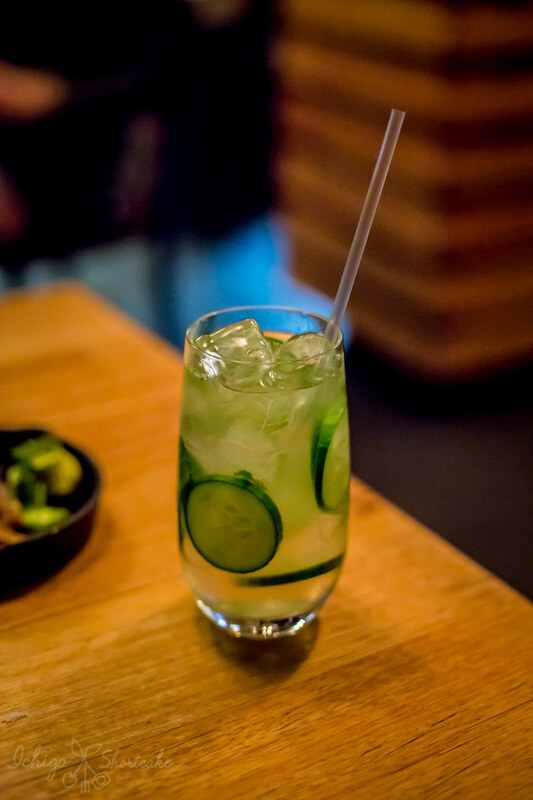 It was a refreshing drink with lots of cucumber to nibble on. 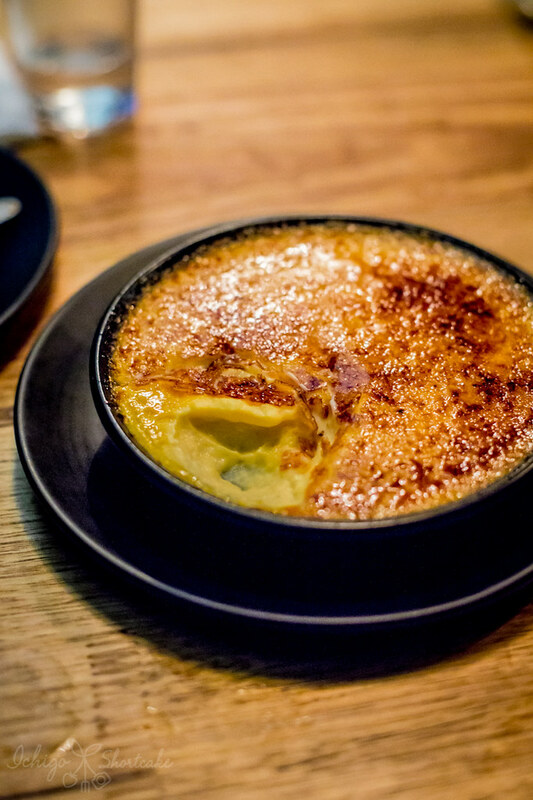 I had know what dessert we would be given right from the start – the creme brulee ($14 a la carte), why of course it would be! It was the most traditional dish on the dessert menu and since every other table were getting them, I figured this was their signature dessert dish. 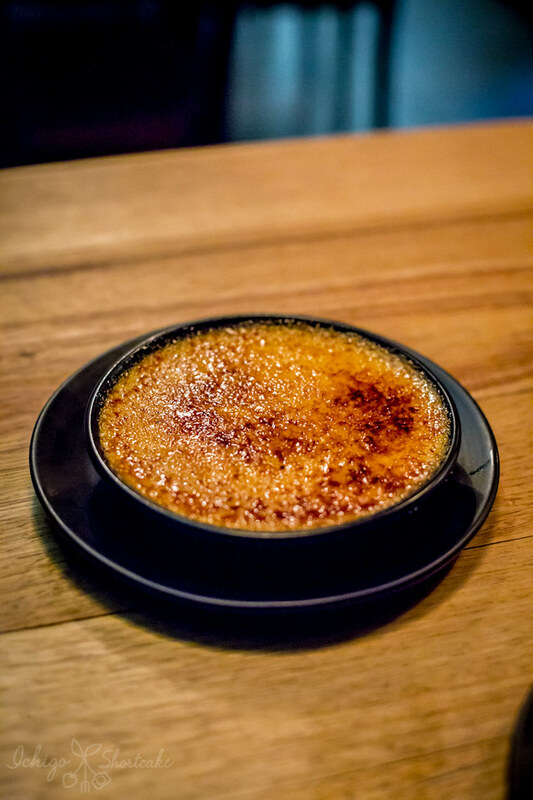 It came in a very wide but shallow bowl which gives the creme brulee more surface area for crispy caramel topping. Unlike many others I’ve had, this version had quite a thin and even layer which was easy to break apart and wasn’t overly hard on my teeth. The custard was creamy and delicious but was still quite a heavy dessert that we unfortunately couldn’t finish. I know I know, it’s a shame to not finish dessert (and was one between two people as well) but we were seriously stuffed. Sorry dessert gods! I’ll try to do better next time. If you did some maths for me though you may have noticed one thing. $65 per person means in total $130 and all the dishes we consumed added together would have cost us $131. What does this mean? We only saved $1 from going with the Feed Me option. For only $1 saving, it’s totally not worth not being in control of what we ate and I would only recommend going for this option if you are too lazy or really unsure of what to order. Still, we left completely satisfied with our bellies stuffed to the brim and taste buds fully excited. 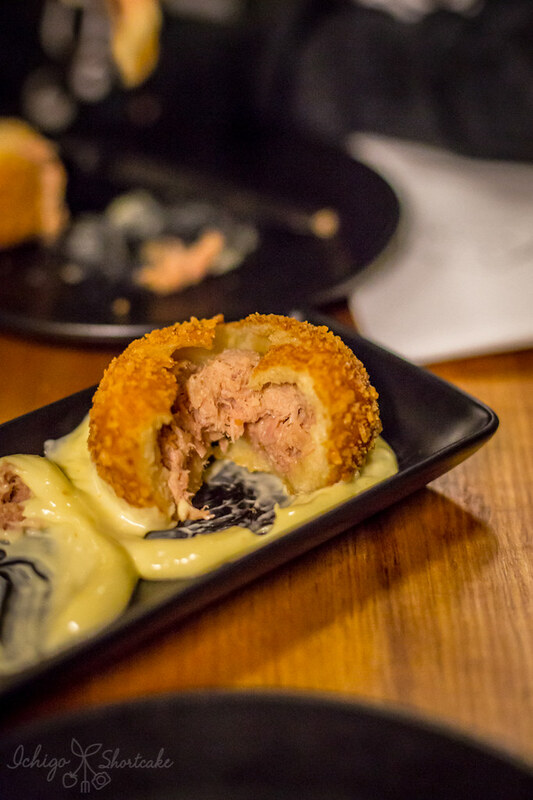 I enjoyed some of the dishes so much that I would come back to have another taste of those – the pulled pork doughnuts, duck main and yes, even the fries were amongst our favourites and are, in our humble opinions, well worth ordering. Just order them, you won’t regret it. 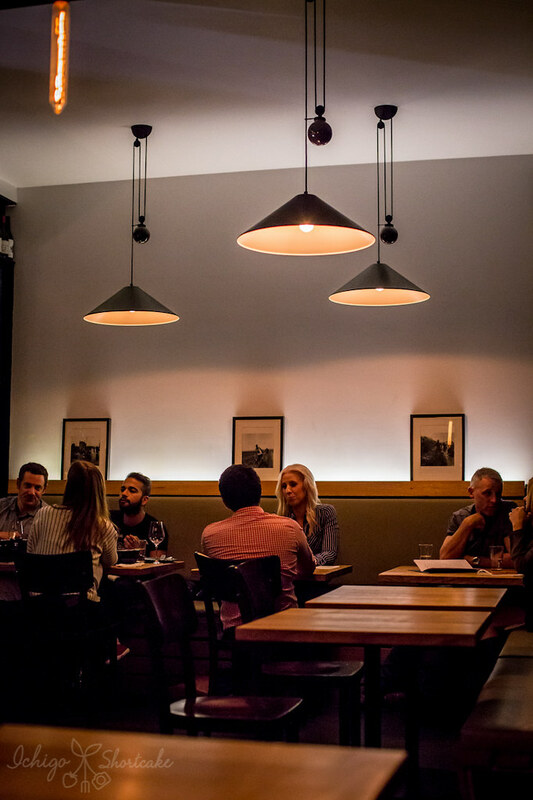 If you’re planning on visiting this awesome restaurant, make sure you book ahead because even late in the evening, empty seats were a rare find. 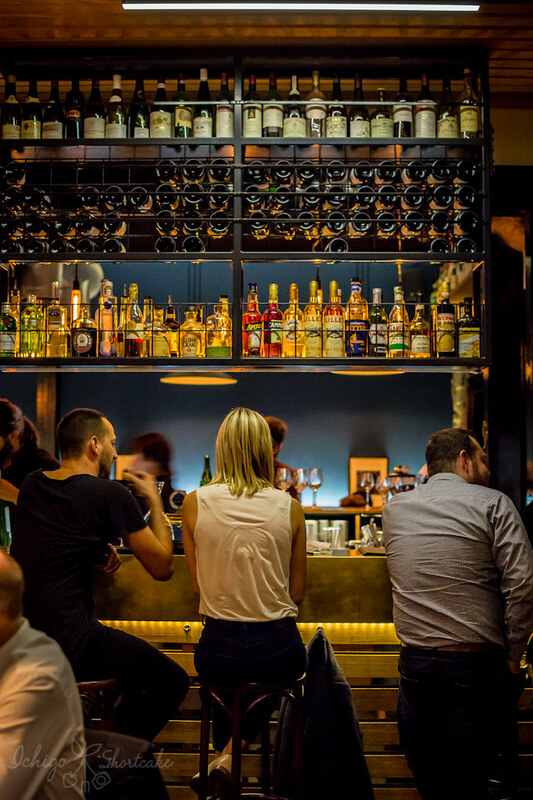 It is also conveniently open until 1am from Wednesday to Saturday for those late night snackers, bar hoppers or the poor souls such as ourselves where early dinners are luxuries that rarely happen. 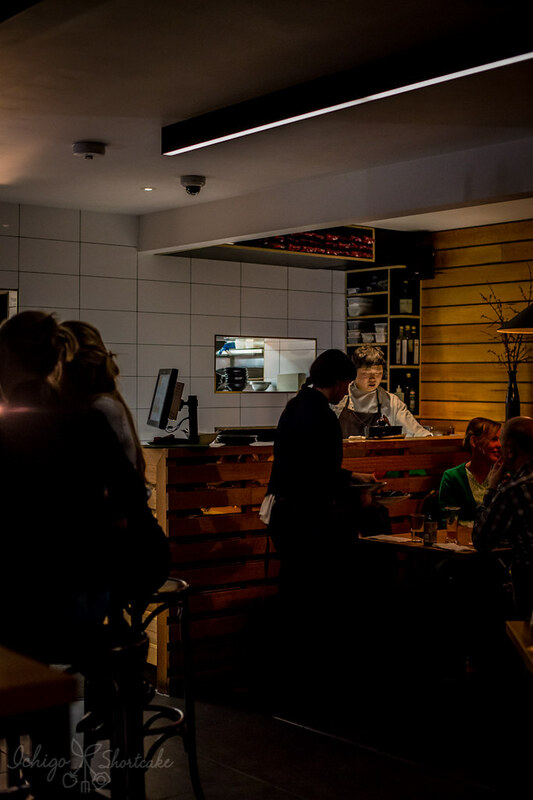 The kitchen closes at 12:45am and will only be serving part of the menu after 10pm. 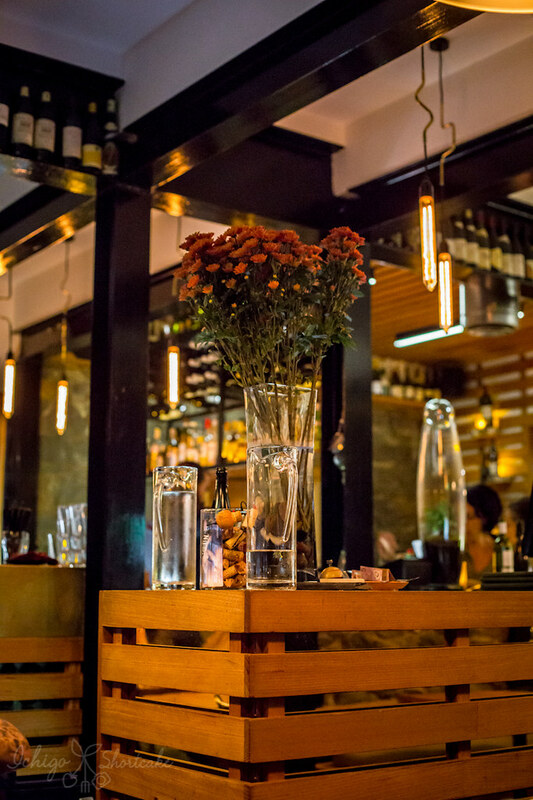 It’s also a fantastic place to treat your mum to a very special and memorable dinner, but pre-booking is a necessity. Delightful -these would be perfect for a place to celebrate.